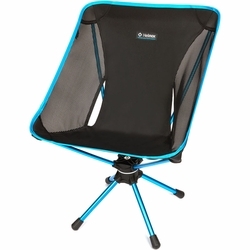 Helinox Swivel Chair. Whether you’re manning the camp kitchen, watching a game from the sidelines or keeping an eye on a family of ospreys, SWIVEL CHAIR makes multitasking more fun. In life, there are those who swivel and those who sit. The choice is yours. It features a lightweight (2.13 pounds), compact (4.5”x 5.5"x 15.5" in its case) and durable design that holds up to 260 pounds.